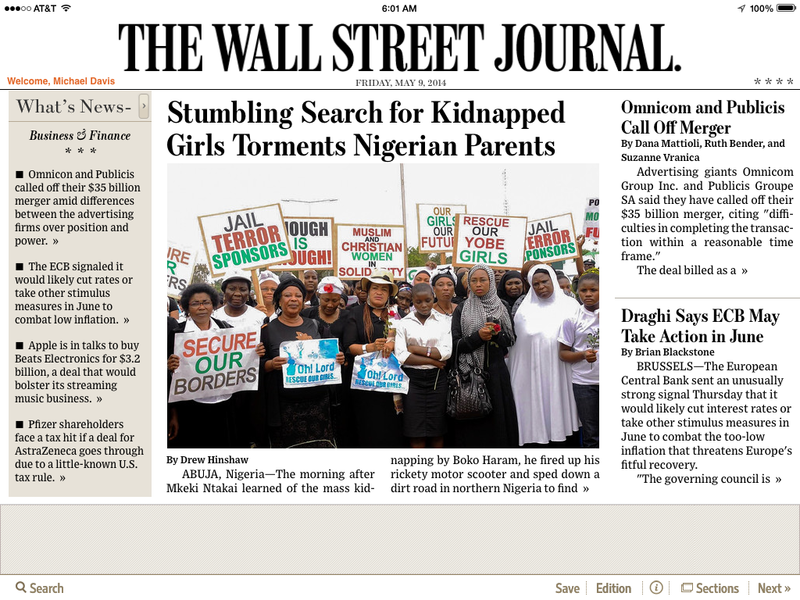 In The Course Of Human Events: Fake Photos of Nigerian Women in WSJ? Fake Photos of Nigerian Women in WSJ? On Friday, May 9th, the WSJ published a photo on the front-page of their print edition (above the fold) and on the homepage of their iPad edition (image below) that appears to be a fake. The photo is ostensibly of Nigerian women protesting the kidnapping of girls by the Boko Haram terror group and promoting the Twitter campaign #BringBackOurGirls. The WSJ removed this photo from the same article on their website during the 10 hour (EDT) on Friday morning. The photo has not turned up in any of the slide shows or other visual media related to the Nigerian kidnapping story since. Are these signs faked? Is this image a fake? If this photo is a fake? If so... Why? What is the story that is not being investigated here? Did the WSJ get duped? Is the outrage over the kidnapping of the girls being ginned up under false pretenses? Why are these women gathered? Who organized them? Who took the photo? Who distributed this photo? I think these are questions worth asking, and worth finding the answers to. I hope some of the Wall Street Journal's competitors decide to look into it. However, the WSJ photo cited by Limits to Growth is a slightly different crop than the image you capture...and I don't think that answers the original question about the signs looking odd. ...are from similar viewpoints as the WSJ photo. Sahara Reporters say that "This report and photos were provided by Prince Charles Dickson." http://saharareporters.com/sites/default/files/page_images/galleries/2014/IMG_3452_0.jpeg ...which exhibits lots of complicated features that would be hard to duplicate in Photoshop. 5. Someone who has the knowledge and skills required to fake the overexposure, warp mapping, and blur would have to have the skills/knowledge to make them look less suspicious (e.g. different font or color selection, etc). A very thorough response, Andrew, thank you for taking the time. I think the conclusion of your analysis has to be that the photos are real. It is strange that these photos disappeared from the WSJ, though, without being reincorporated in the slide show that replaced the photo. One larger comment: the manner of this protest... how it surfaced, the fact that it was coordinated with the White House, that there was so much pre-printed signage... it leaves... questions in the mind as to the nature of the protest. Luther would advise us here to put the best construction on everything, so I guess one should just take it all at face value and move on. It is undoubtedly a tragedy, that the girls have been taken prisoner, and that tragedy deserves a remedy regardless of any possible ulterior motives by those behind the protest's organization.